Optimus IT Review 2019: Is Optimus IT a Good Hosting? 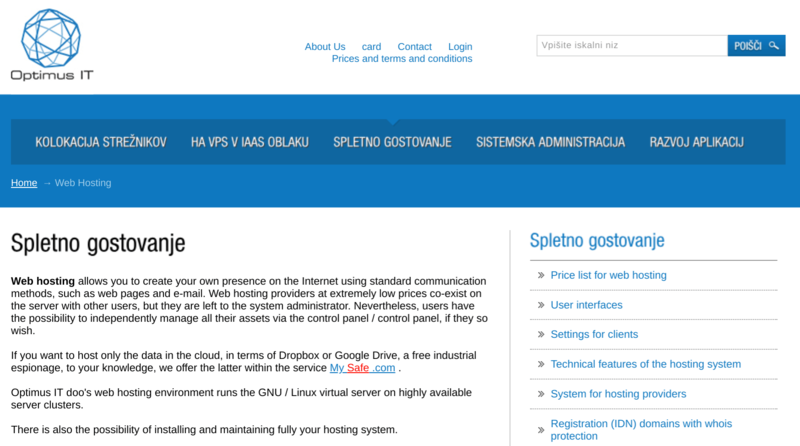 Optimus IT provides a simple selection of Slovenian hosting products. Although the prices are slightly high, there are expert features provided by a team of industry experts who offer 24/7 customer service with rapid response times. Founded in 1997 as ISG, and rebranded to Optimus IT in 2013, this is a small Slovakian hosting provider which (according to third-party information) currently has more than 4000 domains registered. The Optimus IT website is in Slovenian. Optimus IT owns its own data center in Ljubljana, Slovenia, which is good because this generally means rapid responses to technical issues and less likelihood of resources being oversold. 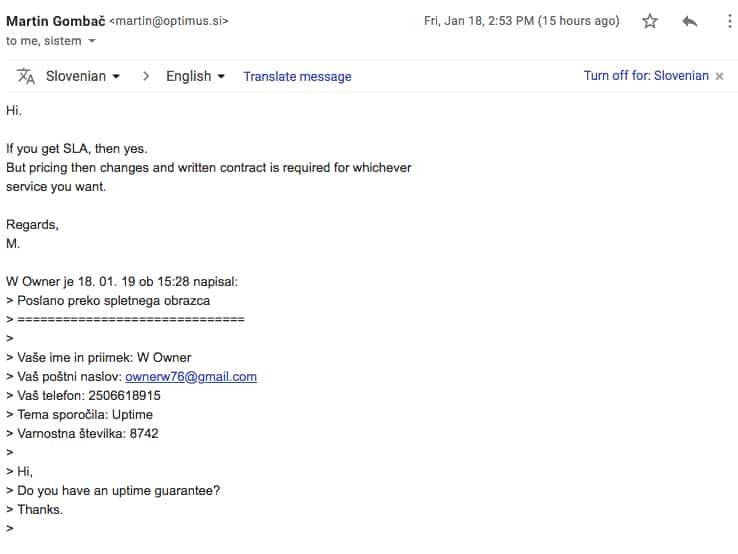 I’m therefore surprised that no uptime guarantee or SLA is openly advertised, although my chat with customer service confirmed that you can get a custom SLA for your contract if you pay extra. All servers use the LAMP (Linux, Apache, MySQL, PHP) software stack, but with old versions of the constituent programs. Developers will also find plenty of supported protocols including SSH, FTP, SMTP, POP3, IMAP2, HTTP/S, plus MySQL. All customers get access to a control panel that enables them to view website traffic data, and to manage DNS, subdomains, FTP and SSH access, databases, email accounts, and more. There are four shared hosting packages: the Bronze package (1 domain and 500 MB disk space), Silver package (5 domains and 5000 MB disk space), Gold package (10 domains and 10,000 MB disk space), Platinum package (20 domains and 20000 MB disk space), and SSH package (same as the Platinum but includes SSH access). The prices are high compared to international competitors, but not so high compared with other Slovenian hosts. Do bear in mind that you have to pay extra for SSL certificates and domain registration. Frustratingly, you cannot buy hosting online with this company, so you have to contact them to get signed up. Signed-up customers can get technical support 24/7 by email, and during working hours by telephone. There is also a 24-hour hotline number for network and server issues. I emailed the company as a non-customer and received a response within 30 minutes that fully answered my question. Optimus IT can boast some impressive achievements such as building the Slovenian electoral systems for people with special needs, and building the first Slovenian public infrastructure-as-a-service (IaaS) cloud. This provider’s lower-tier plans are low on resources, so you’ll likely need to upgrade to the higher-tier plans to get sufficient resources. However, expert-friendly features are included in all plans. Wondering how Optimus IT stacks up against other Web Hosting companies? Enter any other Web Hosting company and we will give you a side-by-side comparison.